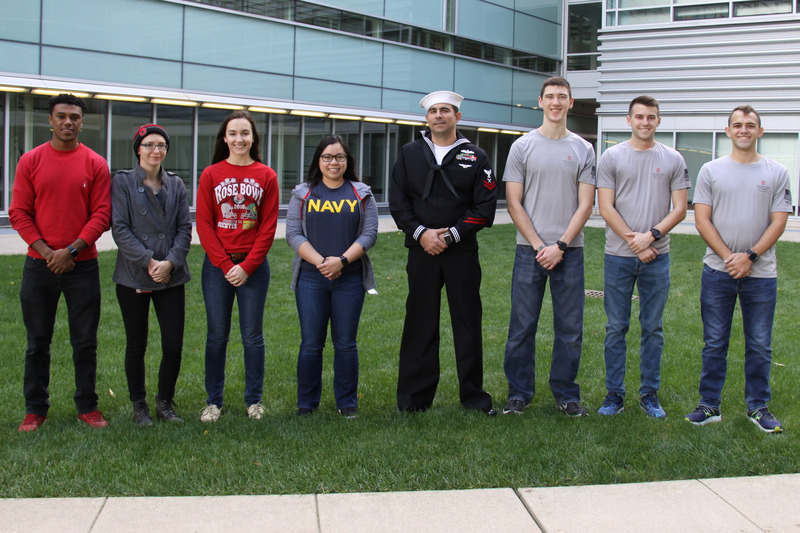 Service to country and engineering have a lot in common for many veteran and military students in the Department of Mechanical and Aerospace Engineering. For these Buckeyes, betterment of society is at the heart of each. Department-affiliated veterans and military students include (left to right) Abiel Kiflu, Brandi Wooten, Haelie Egbert, Thuy Nguyen, Nick Lillios, Andy Rygalski, Tim Gregory and Tommy Balaj“Although engineering and military service each have a different focus, they have the same goal: safety of the public,” said Abiel Kiflu, undergraduate mechanical engineering student and member of the Army Reserve. Kiflu is among a group of department students who have either served or are actively serving in the military. These students’ unique perspectives can enhance their educational experience and bring new ideas to the classroom. The department also holds the distinction of having the university’s first Tillman Military Scholar, Greg Freisinger, who received the prestigious scholarship while completing his doctoral studies in mechanical engineering. The competitive award provided funding for his research into intra-operative knee laxity, in support of his career goal of enhancing the lives of military amputees. Balancing academics and military service, or transitioning from duty to campus life, has its challenges too. Serving this need is The Ohio State University Office of Military and Veterans Services. Staff there provide a range of specialized support for military-affiliated faculty, staff and students. Not only does the office help students navigate university systems, but it also houses the volunteer Community Advocate Program. Mechanical engineering student Haelie Egbert is among over two dozen volunteer advocates who support veterans and military students across campus. “As an advocate, I help connect veterans and military students to resources and experiences to boost their academic and professional success,” she said. Egbert, an Ohio Air National Guard member, supports students throughout the College of Engineering, where her role allows her to serve as a liaison. “My position allows me to help the college understand the challenges facing military students and veterans,” said Egbert. According to the Office of Military and Veterans Services, a common challenge for students is working through the seemingly competing philosophies of military service and pursuit of higher education. Military duty focuses on service to others, while college success often depends on prioritizing self, they described. No matter the challenges they face while on their higher education mission, a common theme among these students is the importance of community. Did you know? The Ohio State University has officially been ranked as the 8th best college in the country for military and veteran students by College Consensus in 2018.